Yes, summer is very nearly over — but nearly over is not over, right? There are still a few warm days ahead where I live. Here are quick reviews of two last-gasp-of-summer citrus fragrances, and do add any of your own favorites that you'll miss as the days get colder. I'm not going to repeat the whole fake novel by a fake author backstory since I promised a quick review — suffice it to say that Mosaic involves "a spring-fed, Roman-style bathhouse on the edge of The Black Forest in the seemingly serene German village of Baden-Baden". The notes (petitgrain, bergamot, oakmoss, cedarwood, limestone & artesian well) arrange themselves into a neon-bright, sweet-tart citrus with green accents and a sheer floral heart. It's aquatic but not melon-y, clean but not detergent-y, and has a substantial mineral / wet stone component lending some interest (and enough heft to carry it into autumn weather). It brings to mind a cross between Dior Eau Sauvage, Comme des Garçons Energy C Lemon and Terre d'Hermès, if that helps anybody. Great fun, but it has mixed reviews — as always, try before you buy. Imaginary Authors Mosaic is $95 for 50 ml Eau de Parfum. For buying information, see the listing for Imaginary Authors under Perfume Houses. I have no idea why the indie house Providence Perfume Co launched a limited edition citrus so late in the summer, nor do I know just how limited it is, but fans of sparkling herbal citrus fragrances would do well to try Tangerine Thyme before it's too late. Unlike the slightly oddball Mosaic, Tangerine Thyme is very much in the tradition of a classic cologne, done here with all-natural materials including a lovely soft frankincense in the woody base and plenty of juicy citrus in the top (other notes include marigold and petitgrain). As you'd expect with a natural cologne, it is not a powerhouse of longevity, but it isn't dismally short-lived either, and while it lasts, it's the perfect refresher for a summer day. If you don't mind synthetics and a more mainstream feel, the alternative is Guerlain Mandarine Basilic. Providence Perfume Co Tangerine Thyme is $80 for 50 ml Cologne spray. For buying information, see the listing for Providence Perfume Co under Perfume Houses. Note: top image is Fête du Citron, Menton [cropped] by Saskia Heijltjes at flickr; some rights reserved. Thanks for providing more reviews of citrus fragrances! 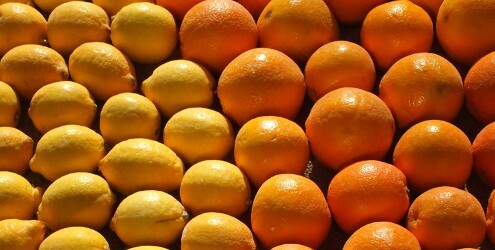 I think I always liked citrus, but reading your blog made me aware of that appreciation. And I like them in the fall/winter season as well (I guess because that is the time I associate with savoring best oranges, mandarins, etc. ), so will continue wearing my favorite Iunx Eau Frappe and l’Artisan Mandarine. Thanks, Robin! For late summer herbal citrus I always love AG Eau du Sud. I have been all out of Sud for a bit, but afraid to go smell a new bottle and be disappointed. I guess I’ll have to bite the bullet! I’m skeered to try new versions of AGs, or anything else for that matter. I’m not close to finishing any bottle, but I hesitate to recommend old favorites to friends, or rely on a sample that’s more than a year old. If I ever find a tester, I will! AG testers are not so easy to come by in my area as they used to be, though. Imaginary Authors is a line that has a few perfumes that I really love but the ones that are misses are awful on my skin. Unfortunately Mosaic falls into the second category as did Falling Into the Sea. I’m still wearing the heck out of L’Artisan Seville l’Aube for that bitter orange opener, it’s by far my most worn perfume of the summer. I know some people really disliked Mosaic! And hey, if your most-worn is Seville, you obviously have good taste. I will have to revisit my sample spray of Mosaic before summer ends!